New! 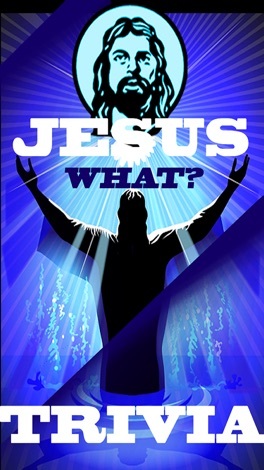 "Jesus miracles" trivia questions added to the already great JesusWhat? 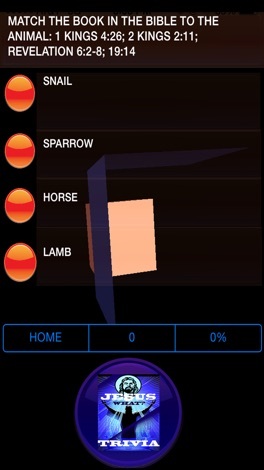 Biblical Trivia Game - a free upgrade bonus for this number one game! Learn more about the early miracles attributed to Jesus in this interactive, fun, challenging bible trivia game. Now updated for newer IOS devices. JesusWhat? 5000+ means more fun for the entire family. Play JesusWhat? on your way to church or while you play. JesusWhat? is stunningly delightful and heavenly enlightening. JesusWhat? 5000+ Biblical Trivia is amazing! JesusWhat? 5000+ Biblical Game has reached number 1 in App Annie's trivia games (paid category). JesusWhat? features over 5,000 bible and religious trivia questions about Jesus, women of the bible, famous cities and events of the bible, Catholic popes and special dates, Roman numbers, animals of the bible, Jesus miracles, Jesus parables and more! JesusWhat? 5000+'s developers 21stCenturyArtists.com are the creators of some of the “best...games released ever” according to critics at Pocket Gamer. JesusWhat? 5000+ Biblical Trivia game is an astonishing follow-up winner for this trivia gaming company. JesusWhat? 5,000+ Biblical Trivia game is for the whole family! Fun trivia before and after you pray, relax or socialize! Go ahead check it out - download and play it now. You'll learn a biblical thing or two or 5000! Did Jesus feed 5000 people? JesusWhat? 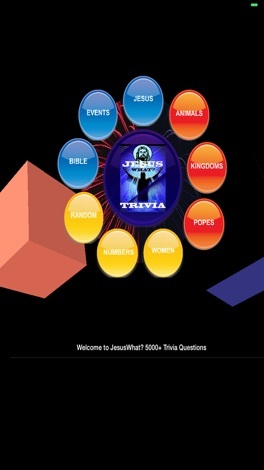 5,000+ Biblical Trivia game knows and JesusWhat? is a must have app for religious scholars and beginners. Start playing JesusWhat? 5,000+ now. JesusWhat? 5000+ is a religious trivia guessing game that's fun and easy - yet hard to put down! Take JesusWhat? 5000+ on your next airplane trip, train or taxi ride, while you carpool or simply enjoy wherever you are. JesusWhat? 5000+ provides educational and learning opportunities for all players. JesusWhat? 5000+ is now available on iPhone, iPad and universal devices. Wow! JesusWhat? 5000+ biblical trivia is simply amazing.